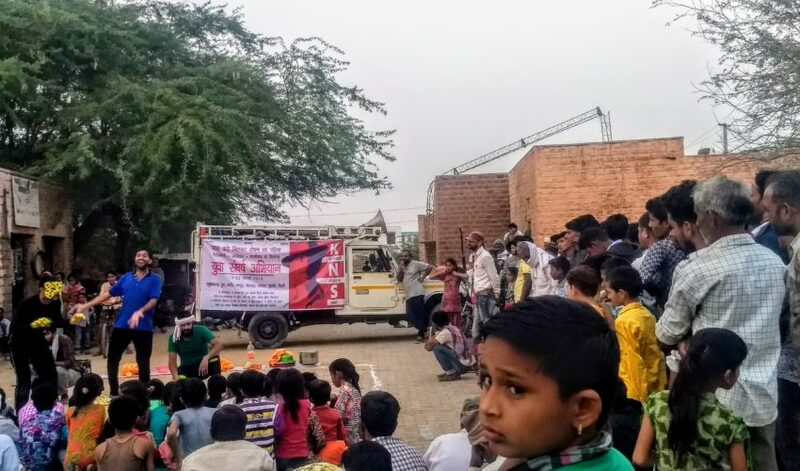 An intense campaign by young workers and students, demanding dignified employment, caste annihilation and protesting rising fascism traveled through the States of Rajasthan, Haryana and Delhi. A report by GroundXero. 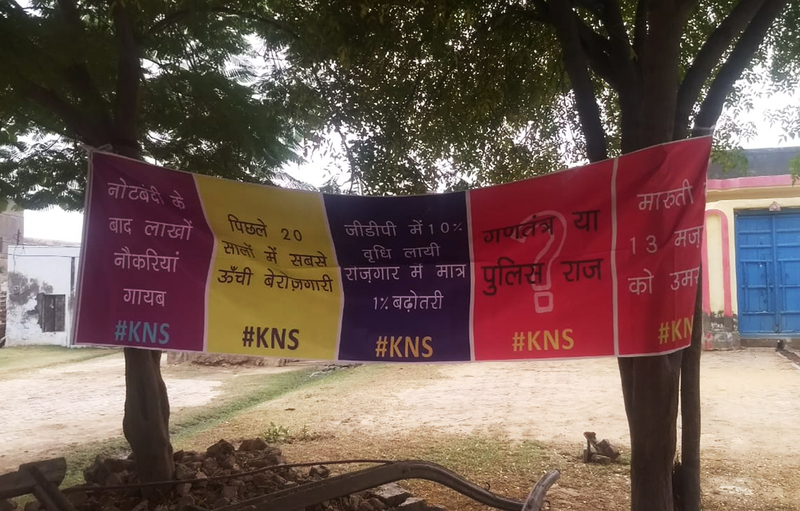 Krantikari Naujawan Sabha (KNS), a leftist youth organization, took out a 14-day Padyatra named Yuva Sangarsh Abhiyan, across Rajasthan, Haryana and Delhi. 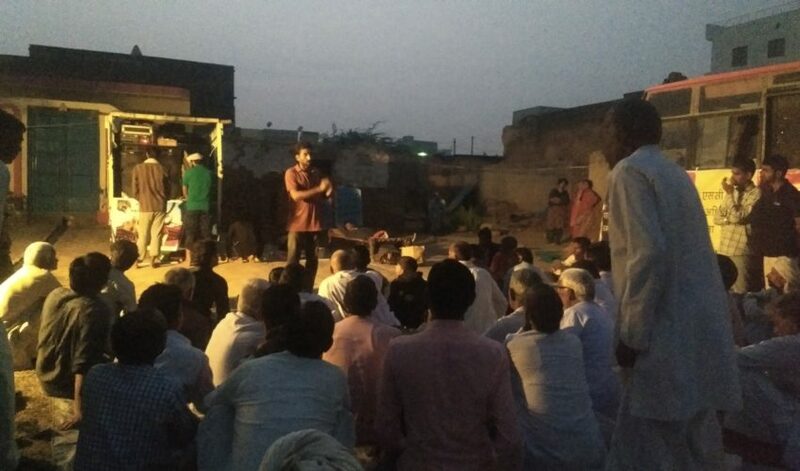 The Yatra by KNS, campaigning against unemployment, communalism and casteism with a call to crush rising fascism in the country, started on 12th evening in northern Rajasthan’s Hanumangarh district and travelled southwest to Churu and Naguar before reaching Jaipur. 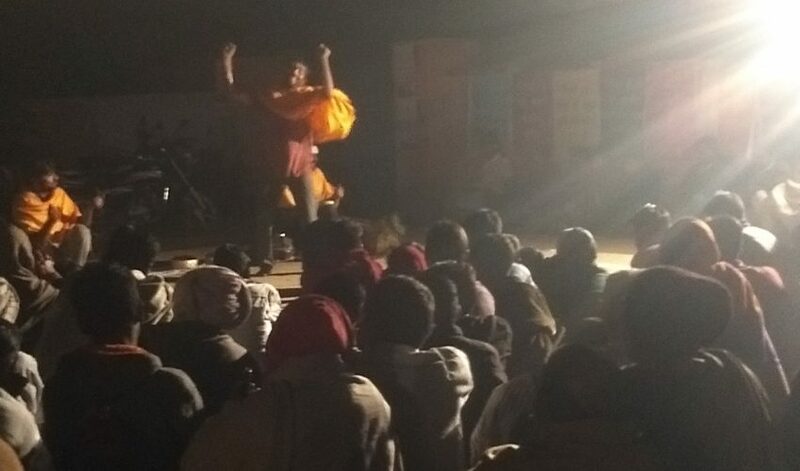 From Jaipur the campaign travelled into the industrial belt of Neemrana, Dharuhera and Manesar and on 21st Nov it reached Wazirpur in Delhi. 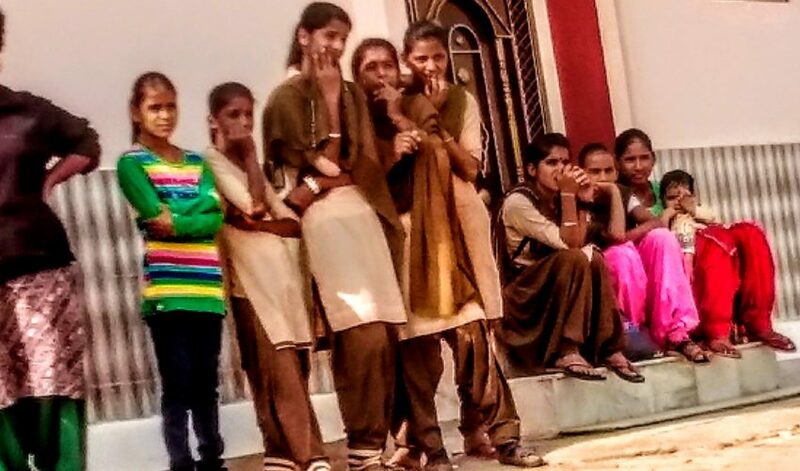 From there they marched to Gurgoan. 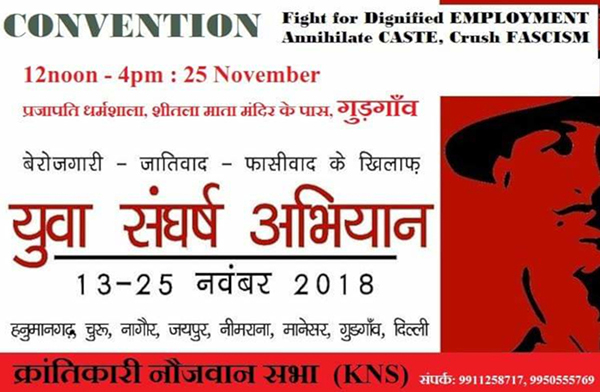 The 14 day campaign through various street corners, factory gates, basti commons, villages and small towns will culminate tomorrow in a convention in Gurgaon on Sunday, 25th November. During the course of this campaign, activists comprising of different sections of the youth, including workers and students, “conversed with farmers seething with rage against the government, informal sector workers barely making ends meet, organized sector workers facing contractualization and criminalization, unemployed people looking for the next non-existent vacancy, creative schoolkids looking at absent futures. 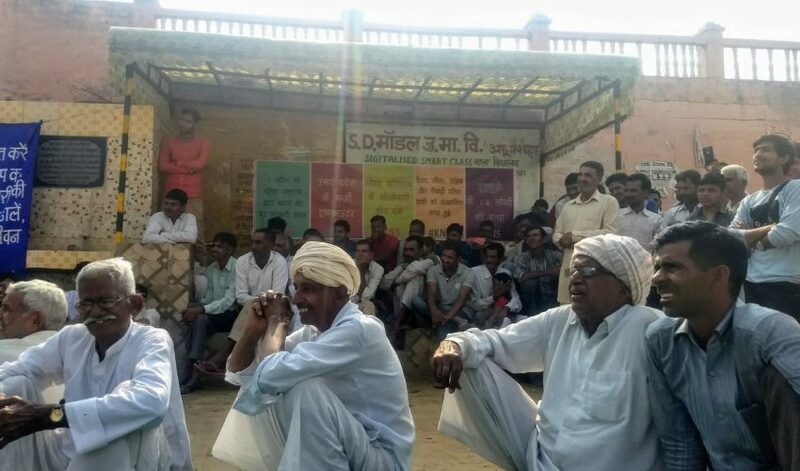 All standing their ground, somewhere knowing their collective strength in the face of increasing adversity, and daily living search for alternatives and emancipation beyond the given systems of oppression.” The Yatra, on its way, showed its solidarity with ongoing workers and peasant movements in the area it traversed, for example, that of the 109 workers in Rico Auto Industries in Dharuhera (Haryana). 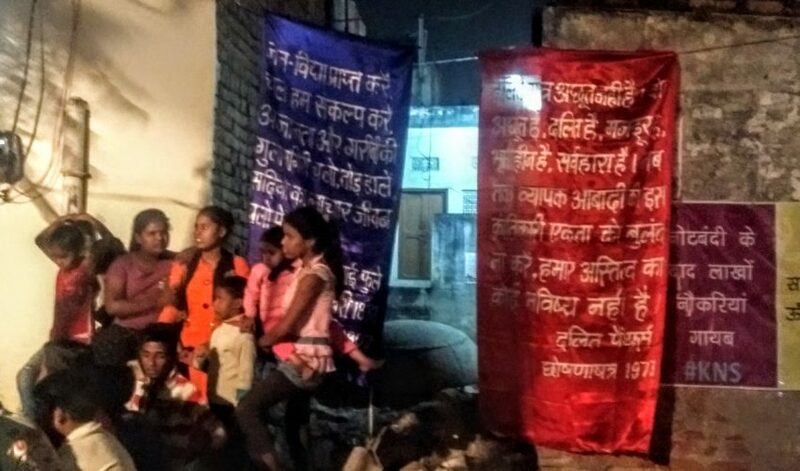 In various street corner meetings held during the campaign the participants took a pledge that they would fight against religious fundamentalism, the caste system in its different manifestations, and raise their voice against oppression of women. 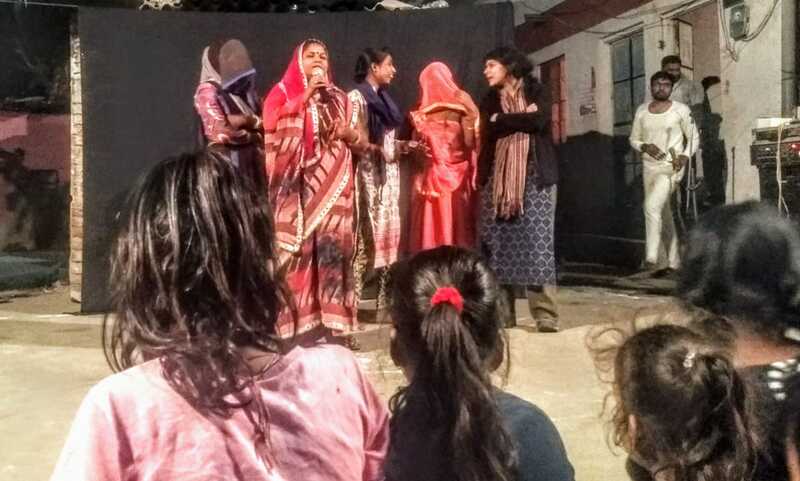 They pledged to work towards establishing social and economic equality by rooting out the oppressive capitalist system. 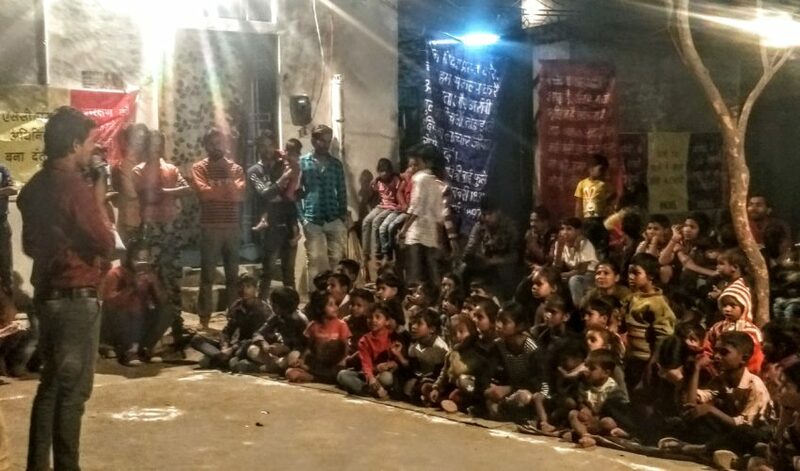 Not only rallies, meetings and conversations, the campaign also comprised of two street plays performed at various venues by the members of KNS: Shahar Mein Aya Tendua – an allegorical critique of capitalism; and Babu Berozgar – a play against communalism and criminalization of minorities. According to the organizers the next leg of this campaign Yatra will be held in West Bengal from 19th to 23rd December of this year.